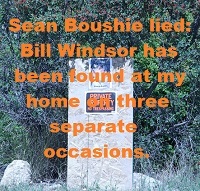 On August 13, 2013, Sean Boushie signed a sworn affidavit before a notary, and he swore that Bill Windsor has been found at his home on three separate occasions. The false sworn affidavit was used to get William M. Windsor arrested and jailed for 134 days. “He has been found at my home on three separate occasions...."
This never happened, and there is no evidence that it did. Sean B**shie made no complaint to the police. There are no records of 911 calls. Bill Windsor has date and time-stamped photos and videos to account for his whereabouts. 1. Require Sean B**shie to provide evidence. Get dates and times. 2. Review Bill Windsor's photos and videos to determine his whereabouts.